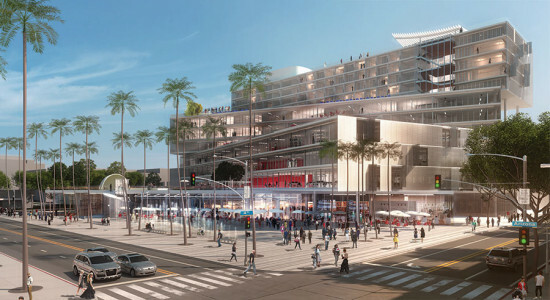 After being sent back to the drawing board last fall, OMA’s mixed use Plaza at Santa Monica appears to be moving ahead once again. Located on a prime piece of Santa Monica–owned real estate on Arizona Avenue between 4th and 5th streets, the development—part of a glut of new mixed-use projects in the city—will be OMA’s first ever large scale project in Southern California. They are partnering with local firm Van Tilberg, Banvard & Soderbergh (VTBS). At a recent Architectural Review Board (ARB) meeting, the OMA-VTBS team presented its original proposal at 148 feet high and an alternate the city had asked them to consider at 84 feet. “Overall, the Board was very pleased with the design ideas and the potential that it represents,” said Francie Stefan, community and strategic planning manager for the City of Santa Monica. She noted that the concerns raised by the board had to do with daylighting and ventilation strategies for such large floor plates. According to Santa Monica Special Projects Manager Jing Yeo, since OMA is still collecting input they have not yet started on such revisions. Regardless of building height, the board wants the major concept elements to be carried through, including the mix of vertical relationships and the multilevel landscaping that would be done by Philadelphia-based landscape firm OLIN. 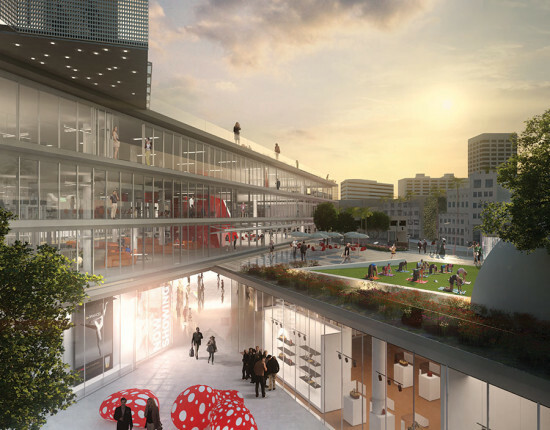 It remains to be seen if the building’s green roofs stay in future renderings and just how much affordable housing can be jammed into the project. Both of these concerns were raised by the selection committee when it issued its recommendation to pursue negotiations with the development team. Since this was just an early concept review, the project will be back a number of times before it gets final approval from the ARB.